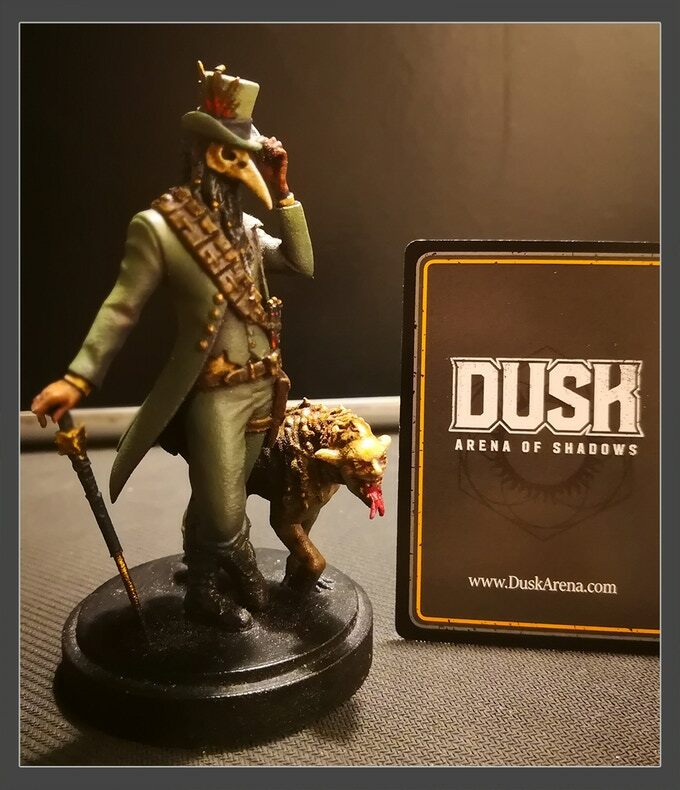 Im Kickstarter zu DUSK: Arena of Shadows geht es um Duelle in einer finsteren Arena mit Modellen im großen Maßstab. 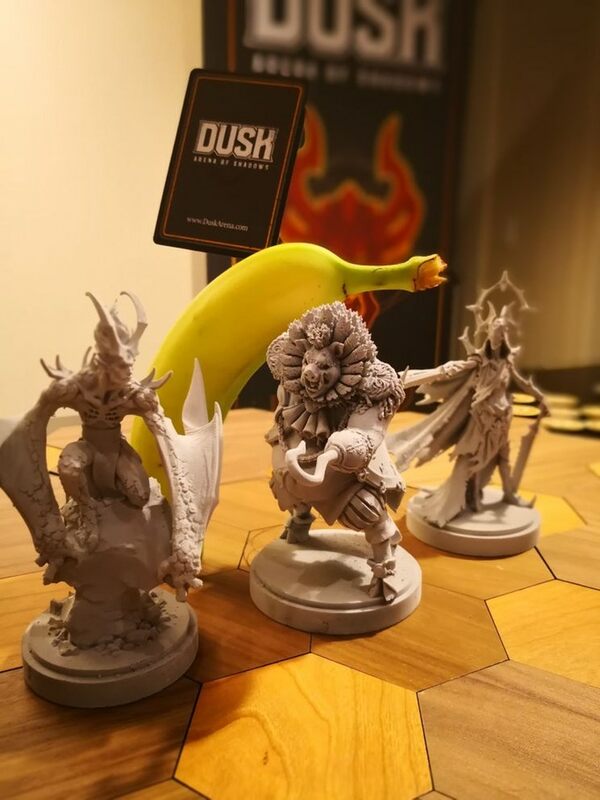 When we created this game, we decided one of our core pillars would be intricate, large scale models that were worthy of display on your desk or shelves. We would have been happy to buy larger models… if we could find them. Instead we made our own! 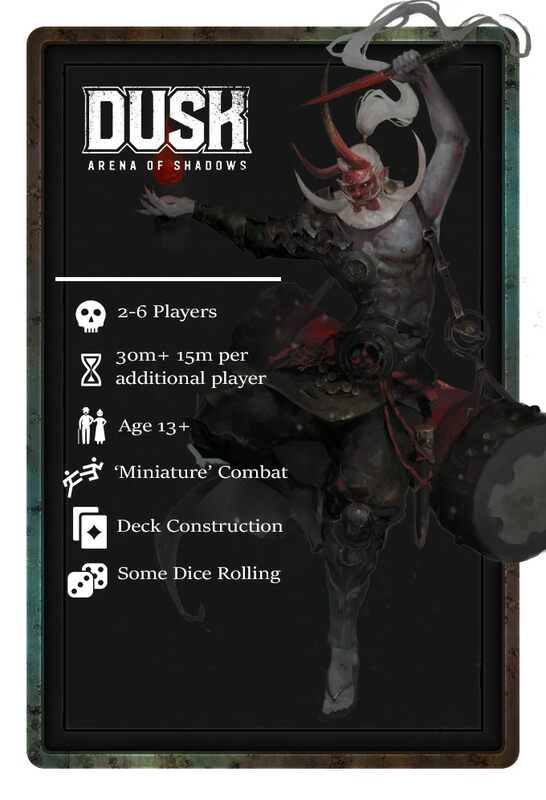 36 Skill cards – Nimbly avoid attacks, go for all-out attacks, concentrate on your gifts – or just enter the arena loaded up on weapons. 36 Weapon cards – Poison your foes, slash through their defense, reap all those in reach – or bring those who aren’t to you. 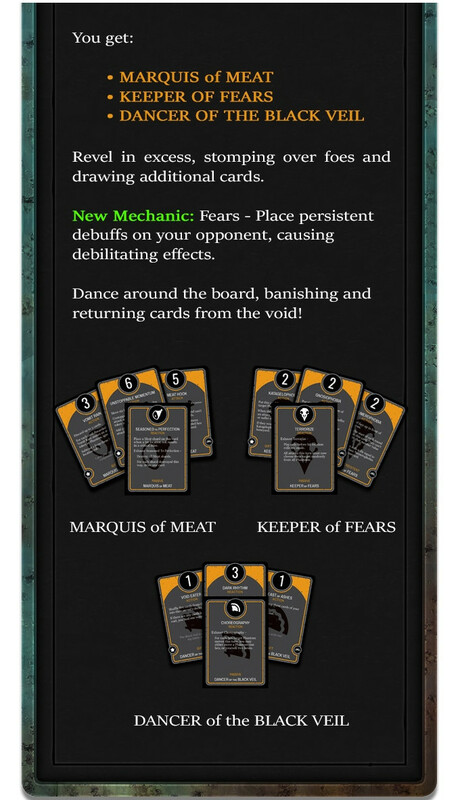 36 Skill cards –Bless your attacks, set deadly ambushes, leave them dazed and confused – or just infest them with the insects at your command. 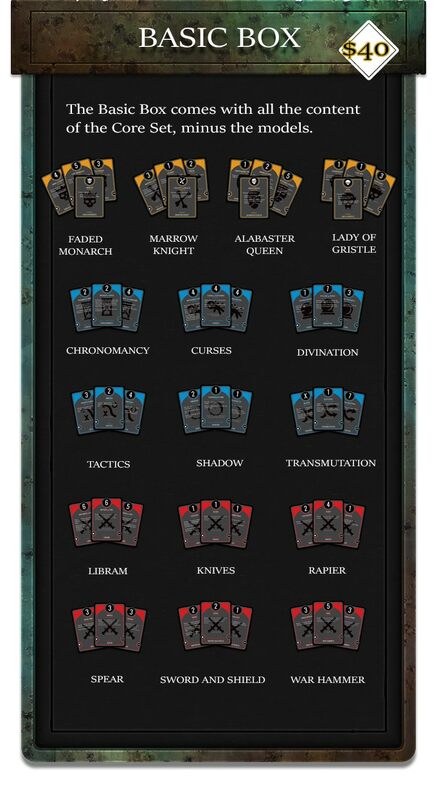 36 Weapon cards. 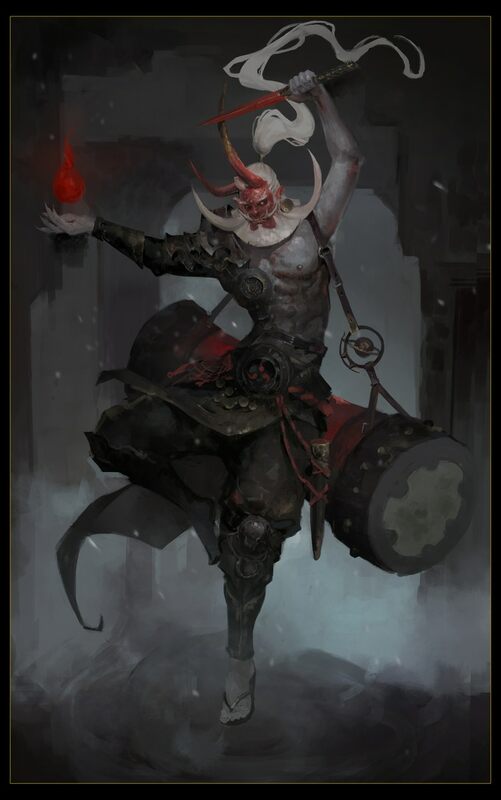 –Keep a full hand, snipe from safety, release a barrage of bullets – or fill the arena with a deadly dirge. 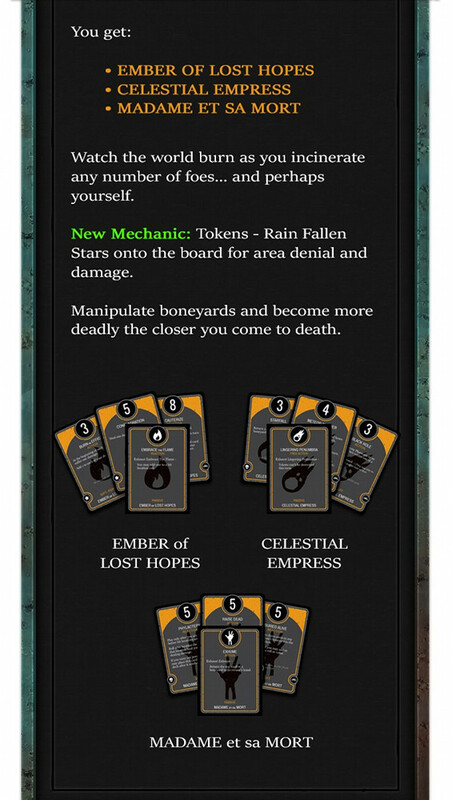 36 Skill cards –Decay their will to live, destroy all they hold dear, place one foot in the Void – or just let chance decide everyone’s fate. 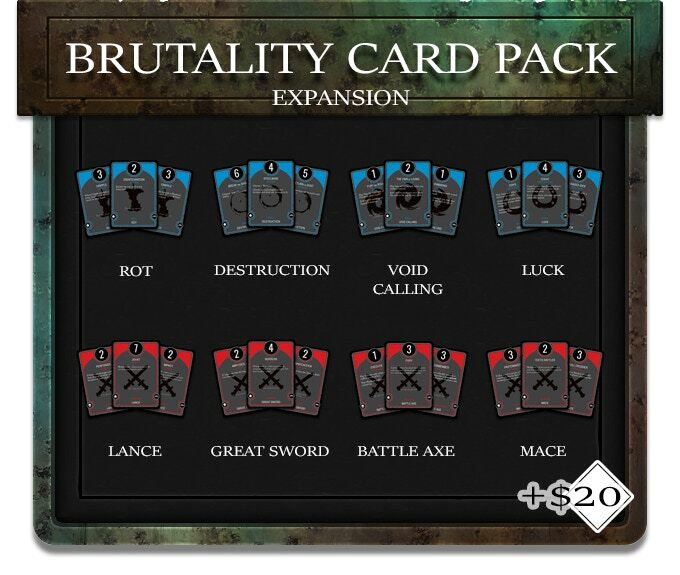 36 Weapon cards –Run down your enemies, use your strength to overwhelm, punish the unarmored – or just crush them inside it. 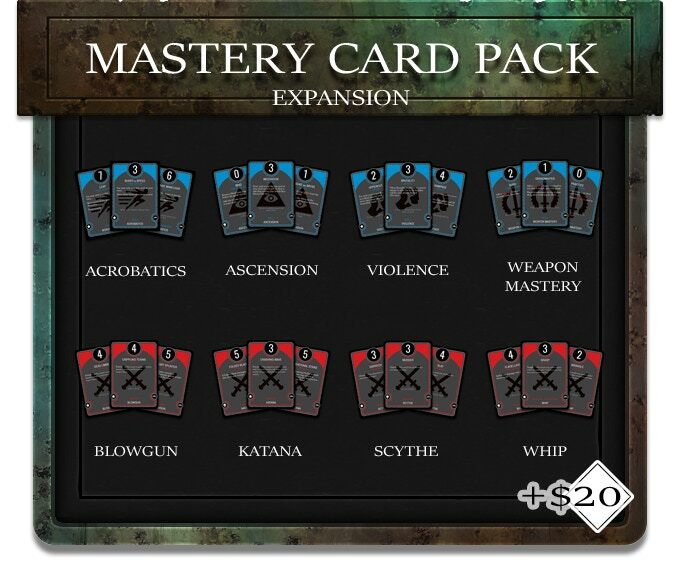 NEW – CARD ONLY PACKS NOW AVAILABLE! 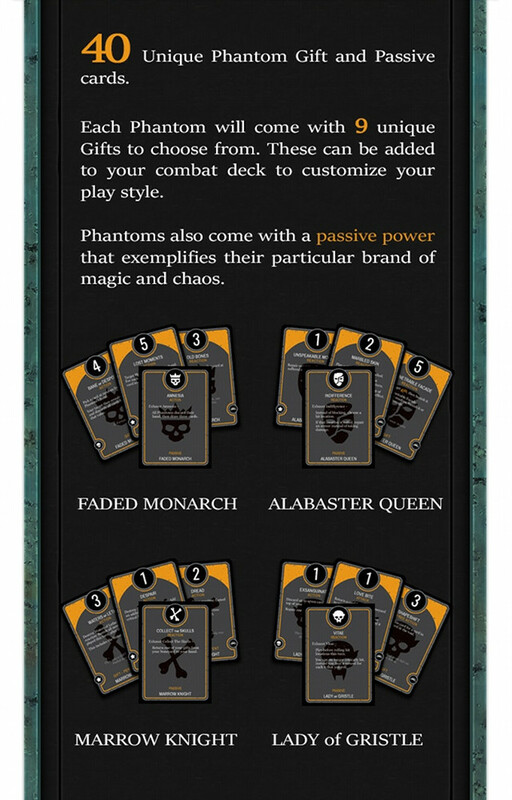 CONCEPT – We work with a wide variety of dark fantasy and cultural influences to make each Phantom unique and awesome. Once we have a theme dialed in, we focus on silhouette and dynamic motion to ensure that each model looks good from multiple angles. ZBRUSH – When a concept is at a level that communicates our ideas, we work with our sculptor to execute and refine it to the physical presence of the board. While the concept is meant to evoke the feeling and initial form of a Phantom, the sculpture often takes those themes and shapes them to fit our desires of things we want to paint or display. FORM 2 – Once the model is in a good place, we print a variety of sizes and materials to see what the best realization of that piece is. We refine the thickness and stability of the model, while also evaluating the durability and physical presence on the board. FINALLY! 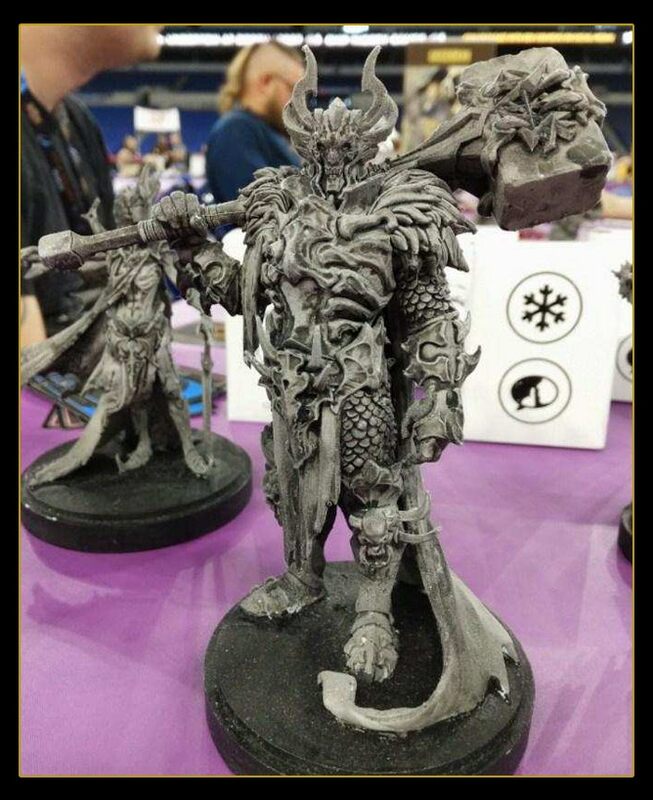 – We take all of those models and we bring them to events and play them with you!… These are currently resin but we are working with our production to cast these in HIPS (High Impact Polystyrene) Sprues. Thanks to their size, we are confident in their ability to retain fidelity. You will have the benefit of a durable model that won’t shatter or become rapidly brittle with age. In addition stay tuned for streams and live events in Austin and Seattle …as well as possible outings in the SF bay area. Oh… It’s been awhile, did we mention these beasties are HUGE?! We are here for the long haul, so let’s get together and talk about what you can expect from us during the campaign. MONDAYS – Every Monday we will share updates on the project and plans for the future of DUSK. TUESDAYS + THURSDAYS – Twice a week we will be doing either live streams or discord chats answering questions Q&A style. 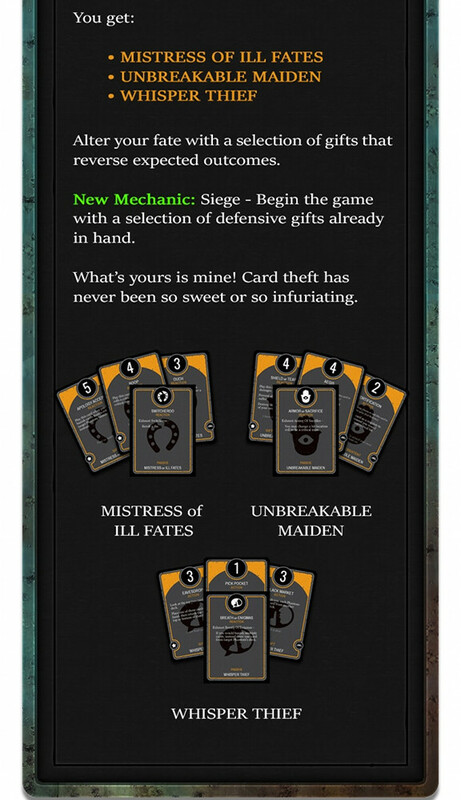 We will reveal stretch goal card sets as they are unlocked, and talk about strategy and hidden combos. WEDNESDAYS – EVENT DAY! – Each Wednesday, we will be hosting live events or playing in streams online. 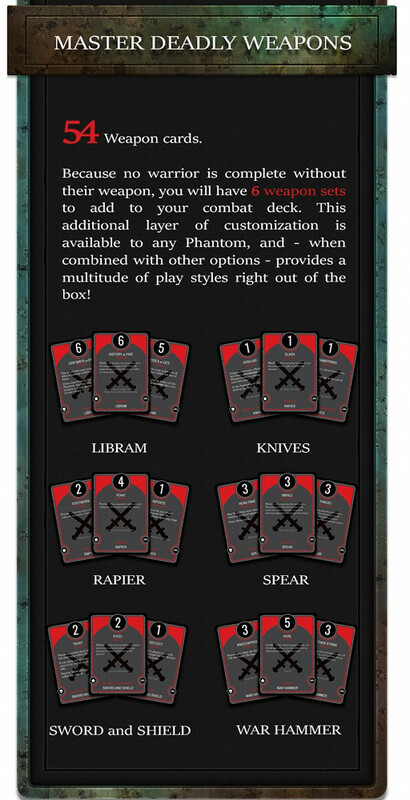 This will be a chance for you to see cards in action and see some of our testers (and us) mix it up. 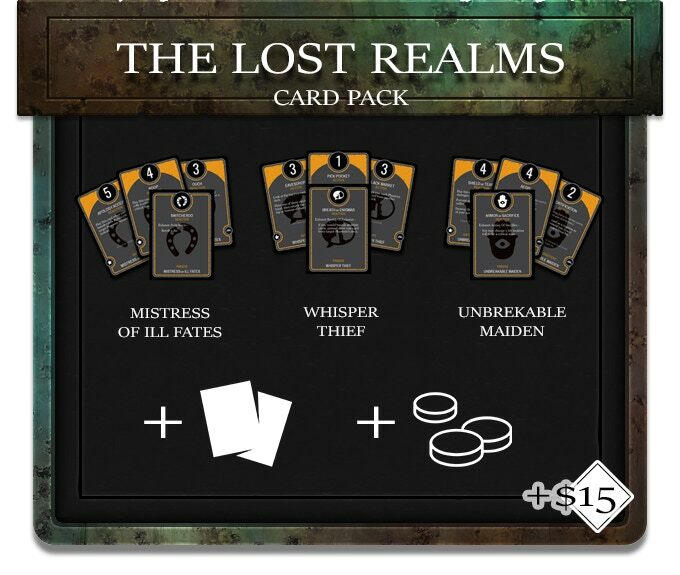 FRIDAYS – SATURDAYS – SUNDAYS – Kickstarters can be grueling. The roller coaster needs some downtime for us to recharge. We will be around, but we don’t want to commit to anything heavy on these days, so that we can be fresh and shiny each new week. If you made it this far then it is time for the big ask. We have poured our hearts, and souls … and savings, into making this beautiful beast come to life. On the bright side, we are ready to go. We are confident from our testing and fan response that DUSK is a great game and it deserves a chance to live. 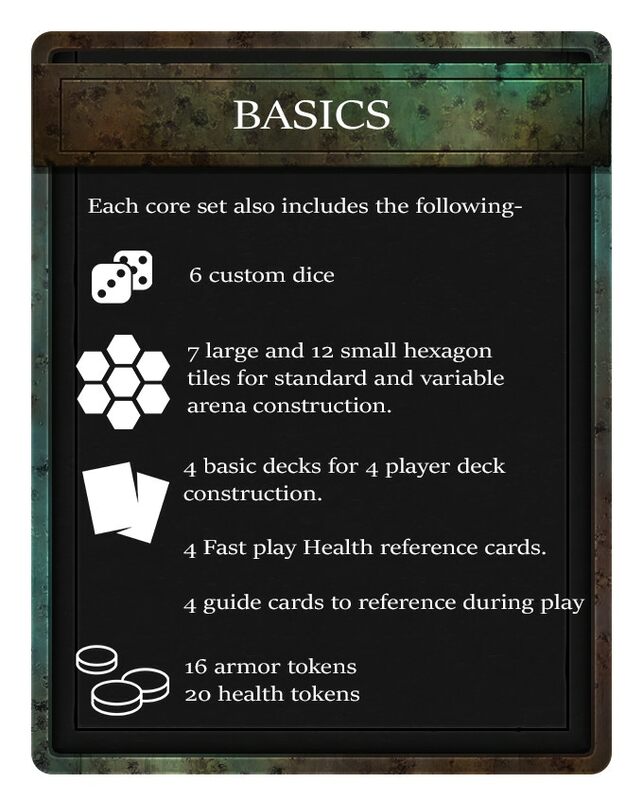 Now, we need production funds to create boxes. 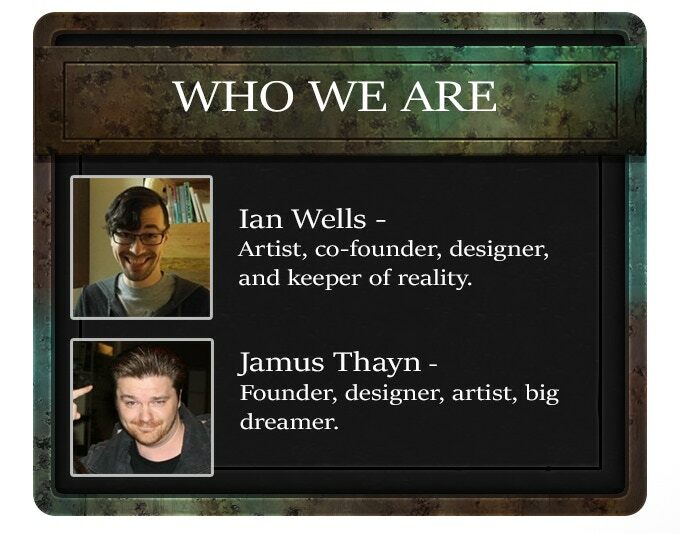 This is where Kickstarter shines. We can come to you, the fans, and if you like what you see, we can build a community around this and make it happen together. If you’re going to dream… dream BIG. We have a huge amount of content that we can’t wait to share with you all. As we get more backers and production gets more efficient, we will be adding additional skills, weapons, and other upgrades. 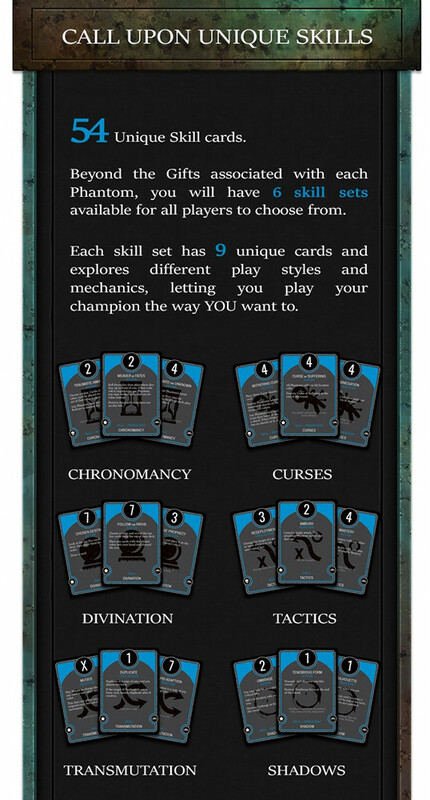 Heck, if things go really well, we may even add a Phantom or two. Let’s do this! Well, obviously we are new… SURPRISE! So, our biggest risk was figuring all of this out and ensuring we could deliver on our promises. Luckily, we had lots of great contacts who have already gone through this that could give us advice and guidance along the way. We also aren’t exactly new to this whole making games thing. 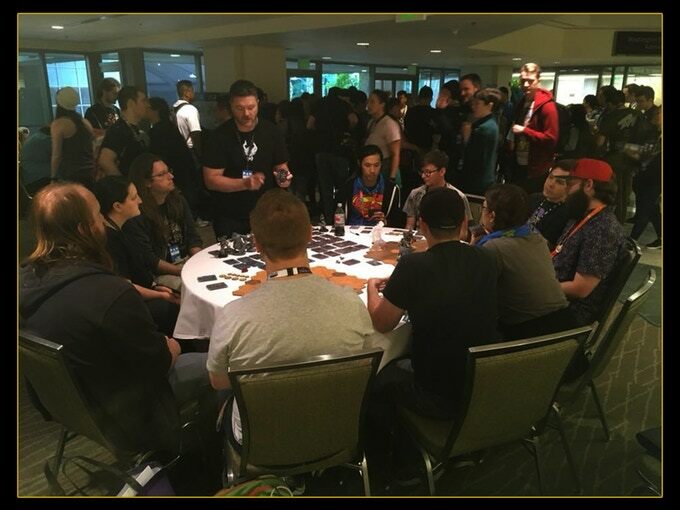 Challenge #1 – For us the number one thing was to make a really awesome and memorable game. 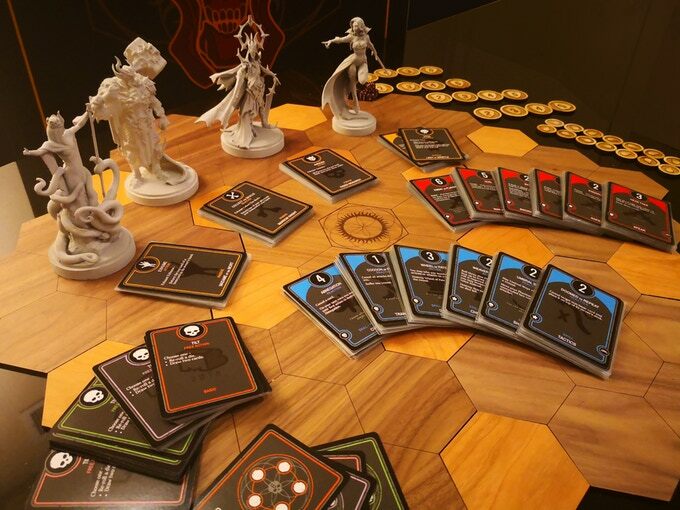 Equally important was to guarantee we priced, planned, and triple checked all of our figures to make sure we could deliver this new game to all of our new fans. 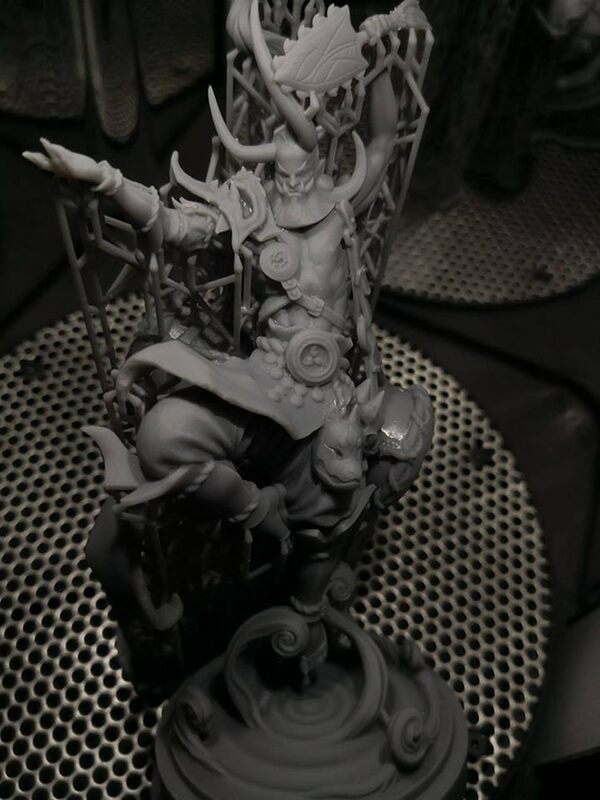 Challenge #2 – Getting across just how massive and awesome these figures are. 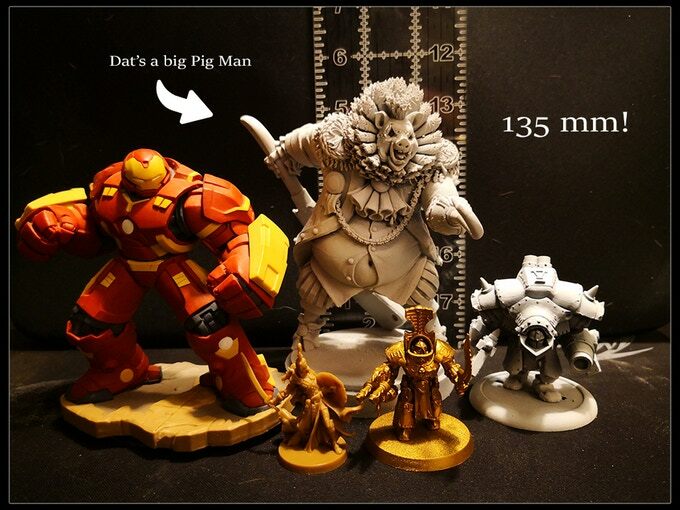 Our costs to produce the miniatures at our scale and quality is not cheap, and we want to price aggressively to compete. Where many games shoot for quantity, we decided to take a gamble on quality. Buying and tooling molds for best results means we have a lot of up front cost. That translates to an expensive product. While we know it’s worth it, and people who see the figures and hold them in their own hands agree, it’s just damn hard to get that across to backers. So, we are going to do as many videos and hands on demos as we can to help share that information with all of you. 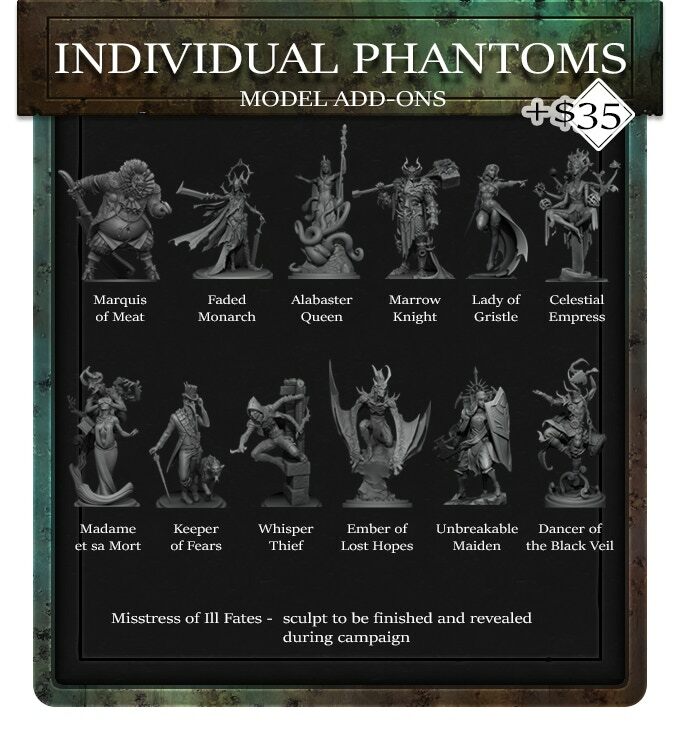 I think these figures at this price is already a fair value, and our basic funding goal ensures we are able to fulfill orders for all offerings. We are going to do everything we can to increase the value for our backers. As our costs get lower, your loot gets richer. We have spent hundreds of games testing and refining. There is so much more content we made that we can’t wait to share with you! Now we just need others to see and believe in our vision; we can make it a reality. 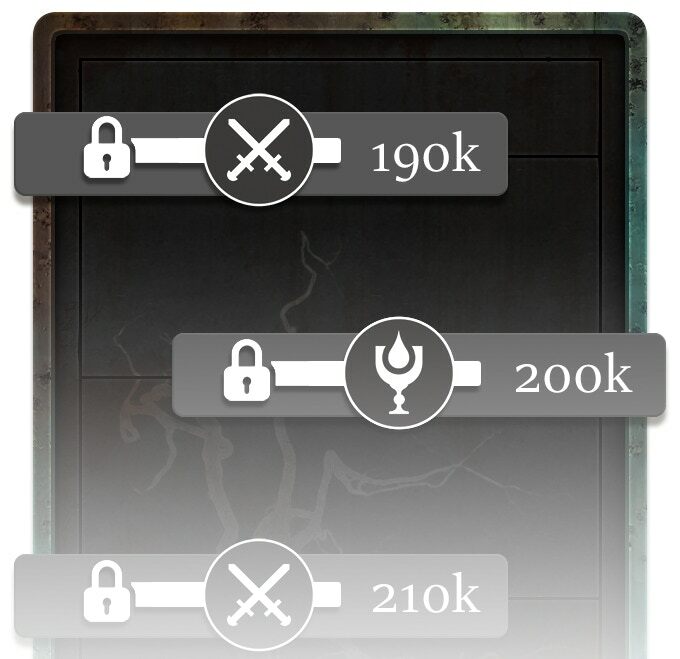 We are filled to the gills with stretch goal content. Over 300 cards and more Phantoms will be added as we get more backers. Die Kampagne hat aktuell eine Summe von 27.448,00 USD, das Ziel liegt bei 180.000,00 USD und läuft noch 31 Tage. Oh mein Gott! Ist das nicht ein Manbearpig? Die Modelle sehen echt cool aus. Ein mutiger Schritt, aber dieser KS nimmt so ziemlich jede Stolperfalle mit: Was ist der Spiele-Mehrwert für die Wahl dieses riesigen Maßstabs? Logistik und Grundpreis ist es schon mal nicht. Die weiteren ebenfalls hochpreisigen addons ziehen noch weiter an der Preisschraube.